More research has been conducted with goats in confinement than on pasture or rangeland; however, most nutrients consumed by goats throughout the world are derived by grazing. There are a number of considerations unique or of special relevance to grazing goats. There are not evaluated methods of predicting feed intake or the activity energy cost of goats while grazing, and development of accurate means will be challenging given the variable conditions under which goats are raised. The activity energy cost of grazing goats can have profound effect on energy required and available for production. In both confinement and grazing settings, high productivity of goat genotypes intensively selected for traits such as growth or milk production can be achieved only with conditions facilitating high nutrient intake. Goats are able to consume a diet considerably different in nutritive value than the average of vegetation available, but insufficient research has been conducted to allow accurate prediction of the composition of the diet actually consumed. Equations to project negative and positive associative effects among feedstuffs in goats have been proposed, but evaluation experimentation is lacking. Previous nutritional plane can have substantial effect on energy required by goats, with marked fluctuation in nutritional plane during the year for grazing relative to confinement settings. Based on some findings with sheep internal parasitism appears to have considerable effect on both energy and protein needs, the impact of which may increase in the foreseeable future as anthelmintic resistance increases. Knowledge of mineral levels in feedstuffs is necessary to avert deficiencies that can have greater effect on performance than energy and protein supplies, and little is known concerning effects of halophytic and salt-tolerant plants as well as saline ground water on efficiency of energy utilization. Plant secondary metabolites such as condensed tannins can have variable effects on conditions that influence performance by goats, although substantial negative impact may only occur with diets primarily of plants with high levels rather than more common diets of multiple plant species. 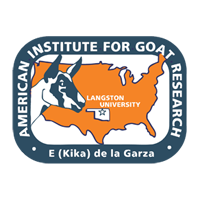 In summary, there are numerous areas concerning the nutrition of goats while grazing where increased knowledge is needed, which in part relates to research challenges in grazing settings.